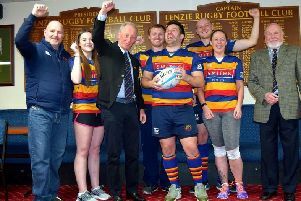 Rugby sides Lenzie and Allan Glen's began their league campaigns with a bang as they ran up huge home victories in their opening fixtures. Allan Glen's demolished Irvine 79-11 in their BT West Division 1 encounter. And Lenzie weren't far behind, hammering Loch Lomond 60-5 in their Division 2 opener. The Glens match with Irvine at The Bearyards was a keenly anticipated one as last season's fixtures resulting in home and away losses for Glens by a mere point in each game. But this one was no close encounter. Glens’ young team controlled this fixture from the outset and ran in a multitude of scores for a strong win. The strength was in the backs who ran amok once the forwards gave them the ball. Glens 2s won 54-14 at Dalziel with strength in the forwards. Lenzie launched their new campaign with a comprehensive win against Loch Lomond at Viewfield in near perfect conditions for rugby. Whilst Lenzie took command of the game from the start the points were slow to appear and after 20 minutes there was only a decent penalty kick by MacKay on the scoreboard. Lenzie were in control of the scrum and line-out with Ferguson, Slade and Mohammad all showing up well and the home crowd were pleased to see Patterson and Scouller add tries to bring the score to 15-0 at the interval. The second period began well for Loch Lomond as the came back into the game with a well worked try; however Lenzie quickly extended their lead through further tries by Moir and Fraser before Loch Lomond visibly tired allowing a late onslaught by Lenzie to rum up an impressive 60 points. Lenzie coach James Le Mar was pleased with the fitness levels and teamwork displayed by Lenzie in the second period although he has identified some areas for improvement for training this week. Man of the match for Lenzie was Immie Mohammad who had his best game for Lenzie by some distance. The two sides will hope to continue their winnign form this Saturday. Lenzie are away to Millbrae while Allan Glen's are at home again, with Annan the visitors. Both games kick-off at 3pm.